ALTHOUGH IT HAS largely faded to the background, the U.S. is currently embroiled in the longest war in its history, the 16-year-and-counting operations in Afghanistan. Despite the declared end of combat operations in 2014, at least 11,000 U.S. troops are still stationed in Afghanistan, and the all-volunteer U.S. armed forces include more than 1.4 million active-duty personnel. In addition, there are 20.9 million military veterans living in the country today, and although there are a number of programs to help them find work after they leave the service, there remain an estimated 453,000 veterans unemployed. These men and women face a number of barriers to finding and maintaining work, including post-traumatic stress disorder (PTSD), traumatic brain injuries, and difficulty transitioning back to civilian life. Veterans who return to the family farm have found that farming requires some of the same skills they used in the military: resilience, a do-or-die work ethic, and physical stamina. At the same time, many veteran farmers find that farm life is good therapy. Around the country, programs such as the Farmer Veteran Coalition, Archi’s Acres, and Combat Boots to Cowboy Boots are helping these former soldiers transition to careers in agriculture. Training veterans to be farmers offers a promising solution to the need to care for veterans and to address the ongoing shortage of farmers due to the rapid aging of the country’s farm population. 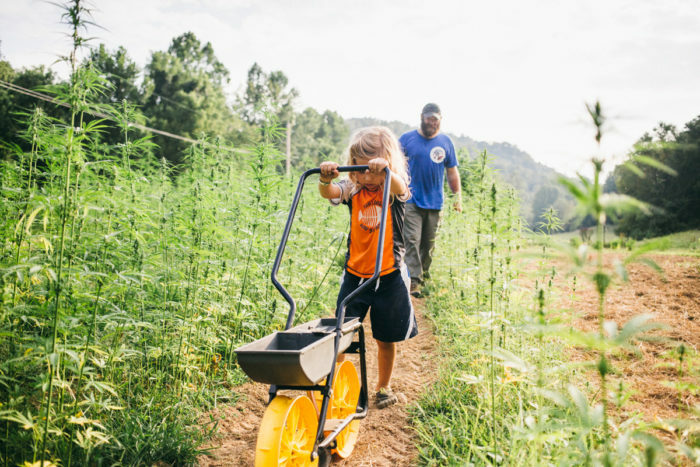 In honor of Veteran’s Day, Civil Eats is profiling five programs that use agriculture to heal and empower the nation’s veterans. 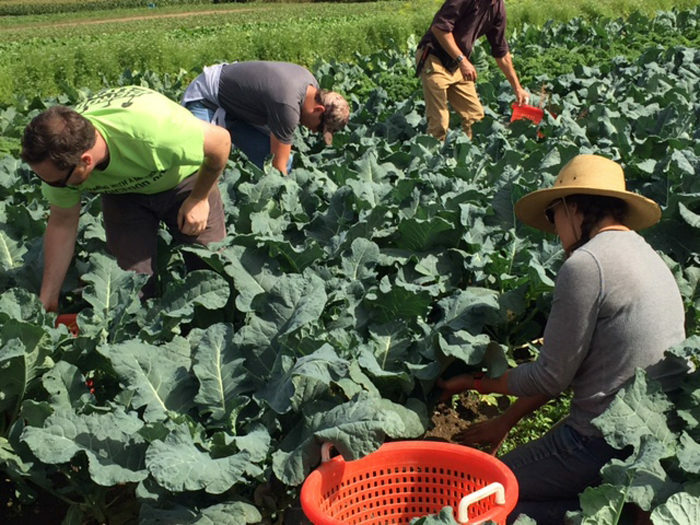 Heroic Food gives veterans a new mission: serving their country by growing food. “Veterans are sitting at home feeling like their duty to serve is over,” said Heroic Food’s communications specialist Jasmin Vazquez. She points out that while veterans need a new mission, America needs farmers. Heroic Food—which was started in 2014 by Leora Barish, the daughter of a career army chaplain injured in Korea—offers a year-long immersion program for veterans who are interested in small-scale commercial farming. Local experts from the Cornell Small Farms Program, the Farmer Veteran Coalition, and the Hawthorne Valley Learning Center helped develop a curriculum with veterans in mind. Each is matched with an experienced farmer who provides a paid internship and on-site housing. For those interested in a shorter time commitment, Heroic Food organizes workshops on the 10 farms they partner with. Topics are diverse and include welding, cheese-making, beekeeping, high-tunnel building, and composting. Heroic Food staff also attend to participants’ psychological needs. Program manager Ryan O’Sullivan, himself a combat veteran, regularly checks in with program participants to make sure they are meeting their professional and personal goals. “If the [Veterans Administration] doesn’t help these struggling veterans, we are going to,” Vazquez said. In Colorado, veterans transform from “protectors into providers” with Veterans to Farmers’ agriculture-based certificate programs in homesteading, aquaponics, in-soil, and greenhouse programs. The training is free and includes a stipend for participants. Founder and U.S. Marine Corps veteran Buck Adams had already established a successful five-acre greenhouse farm, one of the largest in Colorado, when he decided to specifically train and hire fellow vets in 2011. VTF’s hydroponic program lasts eight weeks, provides on-the-job training and includes a curriculum developed with the help of Colorado State University. VTF has also partnered with the CSU Extension office to train veterans in business skills with a Building Farmers course. VTF’s other courses are equally rigorous and rely on partnerships with experts in the community. The 10-week aquaponics program is run in partnership with Colorado Aquaponics and the Mental Health Center of Denver (MHCD). The soil-based program takes place at the Denver Botanic Gardens and focuses on small-scale, organic vegetable farming. 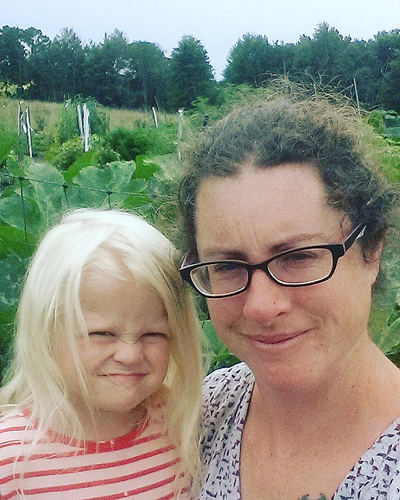 The homesteading program (livestock) is run by veteran-owned Farmer Murphy family farm. To date, 100 vets have successfully completed the training programs. Healing is also at the heart of this Michigan-based program. Adam Ingrao, a former Army Patriot missile fire controller, found that nature—in particular weeding his mother’s flower beds—helped him heal from a training accident that cut short his military career at age 25. He went on to earn a degree in agriculture from California Polytechnic State University and then to pursue a Ph.D. in entomology from Michigan State University. His experience as a beekeeper made a lasting impression. “Beekeeping is kind of a meditative experience,” Ingrao said. In order to keep the bees calm, beekeepers need to be very mindful of what they’re doing and maintain calm themselves. He realized that other veterans could benefit from working with bees, so he and his wife Lacey started Heroes to Hives in 2015. 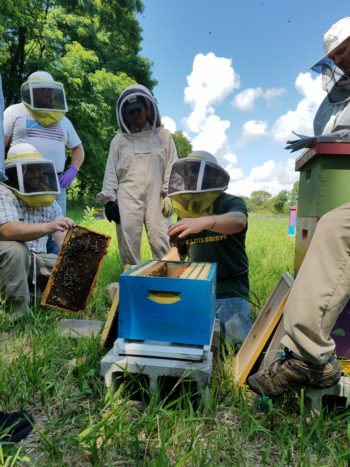 They took five combat veterans through a nine-month program that trained them in the science and business of beekeeping. Their success attracted funding from the AT&T Foundation and a partnership with the MSU’s Michigan Pollinator Initiative. In the second year of the program, Heroes to Hives mentored 15 combat veterans, 80 percent of whom have a service-related disability, PTSD, or a traumatic brain injury. The vets work directly with hives, learn the science behind beekeeping, master best business practices and connect with potential employers. Heroes to Hives is free for participants and tailors instruction time to the students’ work schedules. Now that it has joined forces with MSU, Ingrao expects the program to grow in services and capacity. According to the Center on Budget and Policy Priorities, 1.7 million veterans use food stamps to feed themselves and their families. That statistic doesn’t sit well with Mike Lewis, a veteran of the 3rd U.S. Infantry, The Old Guard. Add the fact that veterans disproportionately come from rural areas, and Lewis, who is a farm advocate in rural Kentucky, takes this statistic personally. “You come from a community that feeds the country. Then you go to defend the country and [when you come home] the land that you defended can’t even feed you,” he says. Lewis watched his brother Fred struggle after coming home from multiple tours in the Middle East with a traumatic brain injury in 2009, and saw firsthand how therapeutic life on the farm was for him. He founded Growing Warriors, a non-profit that has been teaching veterans how to feed themselves, in 2012. “Initially we started with a small garden with about 10 vet families,” Lewis said. Monthly classes covered farming techniques, healthy cooking, seed saving, and food preservation. As the participants of Growing Warriors expressed an interest in farming as a profession, Lewis reached out to other organizations to expand his offerings and provide business training. In 2017 alone, Growing Warriors facilitated more than 50 workshops that covered a wide variety of topics including mushroom-growing, beekeeping, aquaponics, soils science, and organic gardening. The organization also offers a 12-month immersive residential farmer-training program. “[We’re] seeing vets go from wondering what they’re going to do to thinking: ‘My mission hasn’t changed, I’m defending my land through nutrition,” Lewis said. The lush, rolling hills of Westmoreland County in western Pennsylvania are home to more than 1,000 working farms. To take advantage of that deep agricultural heritage, the Westmoreland Conservation District started the Pennsylvania Veteran Farmer Project to connect veterans with farmers and farming resources. Specifically, the Troops to Tractors program matches veterans who want to get into farming with successful local farm mentors. The relationships range from casual farm visits to a paid internships. “[The] mentor farmer is getting a really solid employee … someone with a proven set of skills who is dedicated,” Brooker said. The Project curates a website with information about agricultural job opportunities and ways to secure business funding and educational programs in agriculture. A map of 26 veteran-owned farms and agribusinesses offers another resource for aspiring farmers. Last weekend, Troops to Tractors held their first Farm Trail tour. Eight veteran-owned farms opened their doors to the public, including Fertile Valley Farms, which was started by Army veteran Tammy Preble and her husband.